Live event- and clickstream reporting as people navigate your site or app. In this report, we show a realtime overview of your users and their visits. Each visit or user session is shown as one line in reverse chronological order. The report has numerous options to drill-down/ expand or search specific users. Explore usability and experience page-by-page, by event (swipe, pinch, tap) and click-by-click. The profiles present full visit details, such as search term, company, all activity through time, first recorded entry, geolocation, and referrer info. Full technical details, such as device, platform, ISP, browser, and operating system (OS) are also presented. 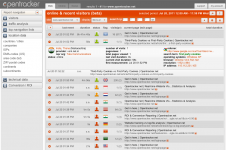 Real-time report showing all user activity to your site or app. For every visit or session you see a complete list of clicks (clickstream) or events (eventstream). Every visit contains a complete visitor profile with technical and behavioral details. This is an interactive report showing user and visitor activity at the individual level. Individual expand – per user Click on the small white plus sign in the red circle in order to expand individual visits per row. User Drill-down Click the user icon (green or red puppet) to load a new page showing you the full event- or clickstream of the user through site or app, dating back to their first recorded activity. Duration Time spent in session or visit. The time indicated is the total of all clicks or events. S.E. means single event. This means that only a single click or event was recorded. Time is calculated by measuring time between events. Therefore when there is only one event, “s.e.” is displayed. Current page (exit page) Shows the most recent page or event viewed. Using the Display Option this can be configured to show page title and/ or url. Thumbnail page images Hover over the small red icon after the page title or url. This will display a thumbnail image of the most recent page viewed. Column selector Open the column selector to specify which columns you want displayed for each visit/user/session. The column selector tool is activated by clicking on the small icon with two triangles just under the Site drop-down selector (see screenshot below). 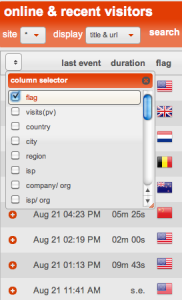 The Column Selector will allow you to activate, among other columns: Flag, Visits, Country, City, Region, ISP, Company, Provider, Area Code, ZIP code, Referrer, Search Term, Status, Number of Visits, Pageviews, Total Pages Viewed, Last Visit Duration, Current Visit Duration, Total Duration, First Measurement, Platform/ OS, Browser, Resolution, IP Address, Country Code. User profile hover Hover over the user icon (green and red puppets) for complete User Profile. Infinite scroll Scroll down the page to see the next 20/40 visits, and continue scrolling as far back as you require. Use the calendar in order to jump further back in time. Options bar Click on the wrench icon to open the Options bar. The Options bar includes: site selection, display options, search-by-ip, expand/collapse, make PDF, download, print, and refresh. Site selection drop-down Select the site or app that you want to view. Display: title & url Shows page titles (as named by webmaster or CMS) and/ or server addresses (urls) pointing to pages. 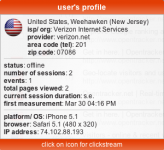 Search ip Find visits from a specific ip address or range. For a partial search, enter numbers from left to right. Expand overview Click the downward-arrow icon to expand all visits and display user profile and events from the last session/visit. Click on the upward-pointing arrow to collapse. Help notes Hover over the question mark in order to see the help notes which are short descriptions and glossary definitions.